The Staff Card is your primary form of campus identification - all staff are expected to have a card. When do I get a Staff Card? On commencement of employment in CIT, each new staff member is issued with an Active Directory account number (unique staff ID) in the format RSSSxxx. Subsequently, IT Services set up an email address and a logon account which can be used on all IT systems. On receipt of an application form from Human Resources, which has been signed by both HR and the line manager/Head of Function, a staff card can be issued. Cards are produced in the Reprographics and Card Services Office located in Room S102 on the ground floor of the Nexus Student Centre. 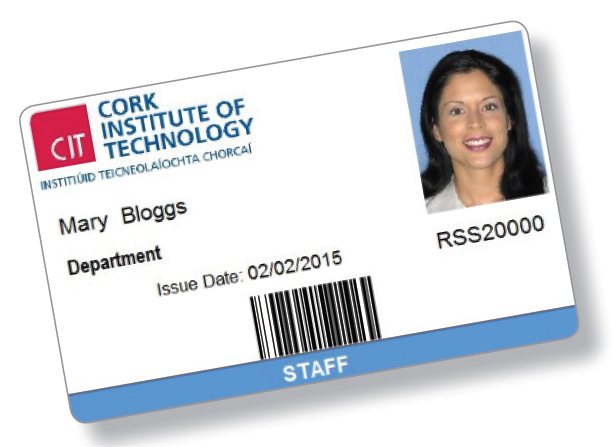 The staff card is the property of Cork Institute of Technology and must be returned to the Human Resources office upon leaving the college. What is my Staff Card for? Your Staff Card is an identity card and more – it has a built in Mifare contact-less chip which makes it a smart card. Your Staff Card acts as a personal electronic purse, where you can deposit money for use at "Smart" locations around campus. How do I put credit on my Staff Card? At any of the tills on campus. For Android users, search for CIT Card on Google Play store. For Apple users, search for CITCard on the App Store. Using the online Web Card Management System , http://citcard.cit.ie/balance/,where money can be transferred from your bank account via your Laser or Credit Card to your debit account. It is a secure process that allows you to transfer funds from a nominated banking/Visa card to your staff card. Should the card be lost or stolen it can be blocked online to prevent anyone from using it. Who do I contact if I have a question about my Staff Card? 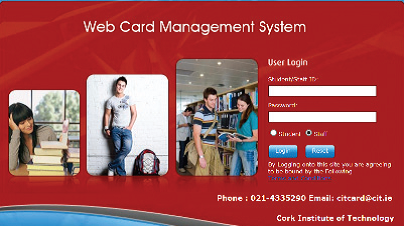 You can email citcard@cit.ie, quoting your staff identification number, explaining your issue.